At the end of the nineteenth century there was scarely an area in which railway projects were discussed more intensively. These plans were partially based on facts and partially on fantasy, such as the the idea of building a standard gauge line running from Fürstenfeld or Feldbach, via Ilz, through the Feistritz valley to Ratten. Later, there was a plan to build a narrow gauge line from Weiz via Anger, Birkfeld, Rattan and Rettenegg to Steinhaus on the Semmering, with a further branch from Anger via Stubenberg and Kaindorf to Pöllau. In addtion there was also an idea to run a metre gauge electrified light railway from Graz – Mariatrost to Hartburg via Sankt Radegund, Weiz and Anger. 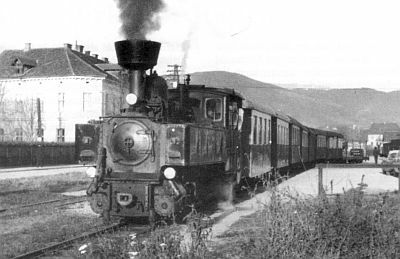 On 11th October 1885 the Graz engineer Lichtenfels submitted a study to the railway authorities for a metre gauge light railway running from Weiz to Rettenegg, and which was seen as a connection to the Gleisdorf – Weiz project. The only part which was realised was a 15km standard gauge section between Gleisdorf and Weiz. In 1901 the private Gleisdorf – Weiz railway company decided to extend the standard gauge line to Pöllau via Anger. There was also interest in a branch from Anger to Birkfeld, but it was quickly realised that, due to the local terrain, the effort required to build a standard gauge line could not be justified for a light railway. The plan was eventually withdrawn in 1904. The only remaining option was to revive the plans for a narrow gauge line. A 760mm gauge was chosen, as, should war break out, it would be possible to take over locomotives and rolling stock from similar lines in Bosnia. The idea of the Anger- Pöllau- Hartberg branch was abandoned, and, as a start, Weiz – Birkfeld was pushed forward. Birkfeld – Ratten, and then on to Rettenegg, would follow later. The supporters of this plan submitted their request to the railway ministry on 12th November 1907. Permission to proceed was received on 15th July 1909, and work started quickly after that. On 15th September 1910 the final concessions were issued with the promise of a grant of 600,000 Krone towards the building costs. The railway never received any of this money, and as a result the Feistritztal was probably the only light railway in Austria not to receive any state support. The formal opening took place on 14th December 1911, and regular schedules began the following day. The line was operated by the Austrian Imperial State Railway on behalf of the Weiz- Birkfeld Light Railway Company. Somewhat surprisingly, the extension of the line to Ratten began during the first World War. As Italy had declared war on the Cental Powers in 1915, the Italian logging companies, Ermolli in Ratten and Lazaris in Rettenegg, were taken under miltary administration. Due to the difficult access, the military managers foresaw great problems in moving the quantities of wood stored there and it was decided, in conjunction with the civil authorities, to extend the railway to Rettenegg. Things moved quickly, and on19th December 1916 a contract to control the progress of the work was agreed with the army leadership. However, as the building work started in Spring 1917, the plans descended into fiasco. Instead of the promised 1000 workers (prisoners of war) the military was only able to provide 300, and they were in such a poor physical condition that they were barely able to carry out any heavy work. There was no chance of keeping to the time plan, and, up to November 1918 with the collapse of imperial Austria, none of the four sections had been completed. Due to the poor economic situation, all efforts to complete the extension failed. In 1920 the newly founded company “Feistritztaler Bergbau- und Industrie-AG” revived the plan. A railway was needed to develop the brown coal reserves in Ratten and St. Kathrein, and the company purchased the concession for the half-finished line, and building materials, for five million Krone. They agreed to immediately complete the line as an industrial railway to Rettenegg, and within ten years to convert it to passenger traffic. The work progressed quickly, but only to Ratten, where the company had its mines, and on 11 May 1922 a permit to operate was requested from the Transport Ministry. However, this application was rejected due to the low quality of the construction work, and the poor condition of the quickly procured rolling stock. This did not deter the company from illegally starting goods traffic, and in 1923 it submitted a request to be relieved from the construction of the, for them, uninteresting extension to Rettenegg. Almost immediately, illegal passenger traffic developed on the still illegal line, as this was the only way for the miners to reach the coal pits. In 1925 this led to a massive conflict between the Ministry, who were threatening to close the line, and striking miners who were fighting for a means to reach their work places. An additional problem at this time was that the industrial railway wagons could not be used on the Weiz- Birkfeld branch. The couplings were incompatible and they were not fitted with the necesary vacuum brakes, so the coal had to be unloaded and transfered in Birkfeld. It was urgently necessary that both lines were brought together both technically and organisationally, and on 21 February 1921 the Birkfeld – Ratten section was transferred (with effect from 1st January) to the Weiz-Birkfeld local railway company. The new owners could not consider building an extension to Rettenegg, but they concentrated on improving the exisiting line and meeting the requirements to operate it as a passenger railway. On 29th May 1930 the ceremonial opening for passengers took place, in the presence of, for a remote valley, a range of prominent politicians, including the state president, the minister of trade and the leader of parliament. The line had now achieved the maximum length in its history as the extension to Rettenegg would never be built. In 1942, and until recently, the ownership of the privately owned railway was transferred to the provincal government of Styria. In 1960 the railway suffered a severe blow when the coal mine in Ratten was closed, and suddenly the main income only came from other goods traffic. About the same time, passenger traffic reduced due to competition from road transport, which led to a reduction of services. The railway was also suffering from a geographical problem in that the stations were generally remote from the centres of population, whereas the bus service could drive directly into the centre of towns and villages. Despite the installation of a modern portal crane in Ratten and the purchase of modern diesel locomotives, this trend was not to be stopped. In 1971 the idea of nostalgic steam hauled trains was introduced, and this produced an unexpected increase in interest in the line. In the 1970s regular tourist trains ran between Weiz and Birkfeld, and even on to Ratten, which were enthusiasticaly received and resulted in a completely new volume of traffic. More and more visitors discovered the delights of a magical journey back in time through the Feistritz valley in rocking coaches with hard wooden seats. However, the sucess of the revival trains could not disguise the fact that the financial sucess of the railway basically depended upon goods traffic. As this, with one exception, steadily reduced in the 1980s the service to Ratten was eventually discontinued, and the line dismantled. Today, this part of the route serves as a cycle path. In the following years, the Styrian State Railway company (StLB) gradually withdrew services, first to Anger and then finally to Oberfeistritz, where the only remaining commercial customer, a talcum mine, was located. People who are familiar with the railway will certainly remember with shock the attempt to withdraw the tourist trains to Anger, which would certainly have meant the end of the whole line. Luckily, at the last minute, it was realised, due to the large number of repeat passengers, that the line was a significant tourist attraction for the whole region. After initial trials, and then regular services to Birkfeld, the nostalgic trains allowed the line to survive. After the StLB withdrew completely, the “Feistritztal-Bahn-Betriebs-Gmbh” company was formed, under the leadership of the local tourist organisations, to continue to operate the tourist trains. Thanks to the untiring efforts of its supporters, the railway has now managed to achieve some measure of financial stability and is an important local attraction which is vital to the local economy. The fact that as many important political figures attended the centenary celebrations of the Feistritztal railway in 2011 as did the original opening ceremony, shows that our little railway (sometimes jokingly referred to as the “play thing of a few railway maniacs”) has become a leading tourist attraction for the whole region. Thanks to increasing number of passengers and good utilisation of the trains, the running costs can be covered and sometimes a few Euros come our way to finance some larger projects, such as the much needed general overhaul of the Kh 101 steam locomotive. Thus we can confidentally look forward to the future, and enjoy sharing many more years with our guests on our beloved Feistritztalbahn!